American women finish tied for third with spot on Team USA on the line for London Olympics. The pair could face a coin flip or a runoff for final slot. Allyson Felix and Jeneba Tarmoh (foreground) finish in a dead heat for the last spot on the USA 100M Olympic squad heading to London. They each lean across the finish line in 11.068 seconds. 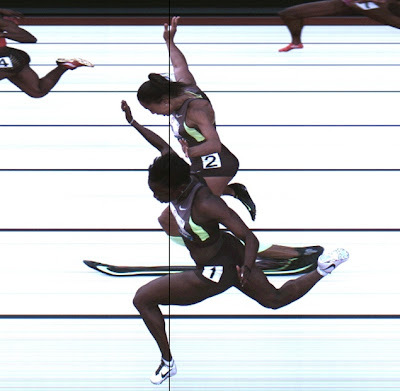 EUGENE, Ore. - It took 11.068 seconds for Allyson Felix and Jeneba Tarmoh to run the women’s 100 final Saturday night. It may take a week before USA Track & Field (USATF) officials resolve their rare dead heat and determine who will be the U.S.’ third female 100-meter representative in London. “Everything I’m hearing is that no decision will be made until after the 200 meters,” said one high-level track and field official here. The 200-meter final Felix is the three-time world champion and Tarmoh is a bona fide contender won’t be contested until next Saturday. Carmelita Jeter, the defending world 100 champion, won the 100 in 10.92, followed by Tianna Madison. The 22-year-old Tarmoh, a former Texas A&M star who just turned pro, finished in a dead heat with Felix, a 10-time world and Olympic champion and one of the marquee U.S. sprinters. In a statement late Sunday night, the USATF said that that if neither athlete opts to decline her position on the 100 team, they will be given an option of a coin-flip or runoff. If they don’t agree, a runoff will be held — certainly the fairest means of resolution. No timetable was given, but the most likely time for a runoff would be in next Sunday’s NBC telecast.